In the Phoenician mythology related by Sanchuniathon, one of the sons of Uranus was named Baetylus. The worship of baetyls was widespread in the Phoenician colonies, including Carthage, even after the adoption of Christianity, and was denounced by Augustine of Hippo. In ancient Greek religion and mythology, the term was specially applied to the Omphalos, the stone supposed to have been swallowed by Cronus (who feared misfortune from his own children) in mistake for his infant son Zeus, for whom it had been substituted by Gaea. This stone was carefully preserved at Delphi, anointed with oil every day and on festive occasions covered with raw wool. In Rome, there was the stone effigy of Cybele, called Mater Idaea Deum, that had been ceremoniously brought from Pessinus in Asia Minor in 204 BC. 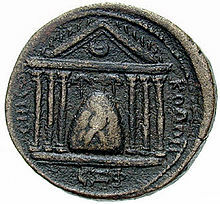 Another conical meteorite was enshrined in the Elagabalium to personify the Syrian deity Elagabalus. In some cases an attempt was made to give a more regular form to the original shapeless stone: thus Apollo Agyieus was represented by a conical pillar with a pointed end, Zeus Meilichius in the form of a pyramid. Other famous baetylic idols were those in the temples of Zeus Casius at Seleucia Pieria, and of Zeus Teleios at Tegea. Even in the declining years of paganism, these idols still retained their significance, as is shown by the attacks upon them by ecclesiastical writers. A similar practice survives today with the Kaaba's Black Stone, which was worshiped by pre-Islamic polytheists. ^ Chisholm 1911 cites Pliny's Natural History xvii. 9; Photios I of Constantinople, Myriobiblon, Codex 242. ^ Palmer 1997, p. 99. Friedrich Münter, Über die vom Himmel gefallenen Steine (1805). ^ Doniger 2000, p. 106. ^ Chisholm 1911 cites Etymologicum Magnum, s.v. ^ Chisholm 1911 cites Pausanias X. 24. ^ Ibn Ishaq (1964). The life of Muhammad. The Folio Society. Bob Trubshaw (February 1993). "The Black Stone - the Omphalos of the Goddess". Mercian Mysteries (14).